The city and municipality of Santa Marta, Colombia is uniquely positioned between the snowy peaks of the Sierra Nevada de Santa Marta Mountains and the sandy beaches of the Caribbean Sea on the northern part of Colombia. This interesting contrast in the landscape makes the area a prime tourist destination for those seeking an relaxing day lazing on the beach and for those who are inclined to explore the mountainous regions. Also known as the Pearl of the Americas, Santa Marta, Colombia celebrates the annual Las Fiestas del Mar or Festival of the Seas at approximately in the middle of the year with a motto that affirms the area’s reputation for having it all. For those who are into cultural explorations, a visit to the Museo del Oro is an educational way to discover the country’s pre-Columbian heritage. The museum showcases numerous Indian artifacts that will satisfy all levels of curiosity among visitors who are interested to know more about the country’s pre-colonial past. A quick tour of the historic grave of national hero Simon Bolivar can be a perfect way to end any cultural tour of the city. Tourists can have all the fun they can wish for under the sun on the El Rodadero Beach, described by seasoned travelers as the less crowded version of Brazil’s Ipanema beach. From El Rodadero, pristine nature is only 34 kilometers away at the Tayrona National Natural Park which is reputed as the most significant ecological preserve in the region. 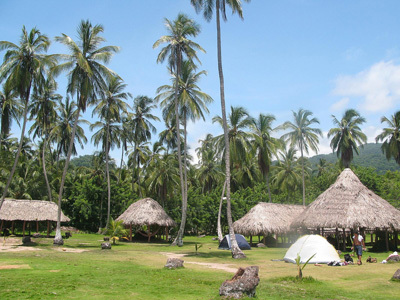 Visitors can discover virgin beaches, native tribes, and unspoiled camping zones within the vicinity. Clear scuba diving sites also abound in the nearby fishing town of Taganga which provides a great opportunity to meet the locals. If sunny beaches does not suit your fancy, the Sierra Nevada de Santa Marta Mountains can provide amazing opportunities for treks amidst a cooler surrounding. This terrain that fringes Santa Marta, Colombia leads to the Lost City or La Ciudad Perdida. The ancient stone structures are poignant remnants of the indigenous civilization that once proliferated in the area between the 11th to the 14th centuries. The area is cooled by surrounding rivers for explorers to take a quick cooling swim. More opportunities to interact with locals abound in the rural farming villages populated by Tayrona Indians. From the nature reserves of the coast to the preserved archaeological structures of the mountains, Santa Marta, Colombia is a unique place in South America that seems to truly have it all.